Survivor: Philippines (2012) - 16th place, 3rd out. 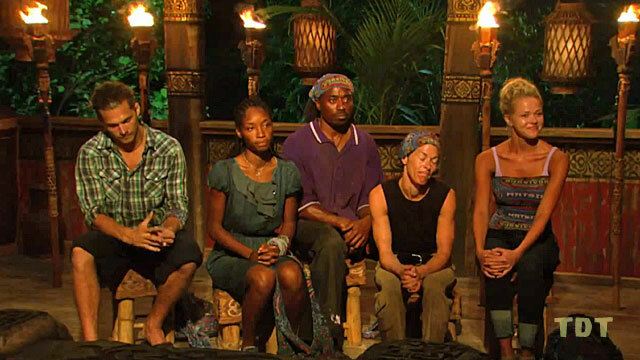 Voted out in Episode 3, "This Isn't A We Game" (Day 8). Philippines Ep. 1 RC/IC: "Share the Wealth" - Does puzzle stage, Matsing loses. Philippines Ep. 2 RC/IC: "Manila Folders" - Hauls the sled once, Matsing loses. Philippines Ep. 3 RC/IC: "Deep In Thought" - Struggles to dive down deep, Matsing loses. Philippines, Ep. 1: Zane Knight (voted out, 5-1). Philippines, Ep. 2: Roxy Morris (voted out, 4-1). Philippines, Ep. 2: One vote, from Roxy. Philippines, Ep. 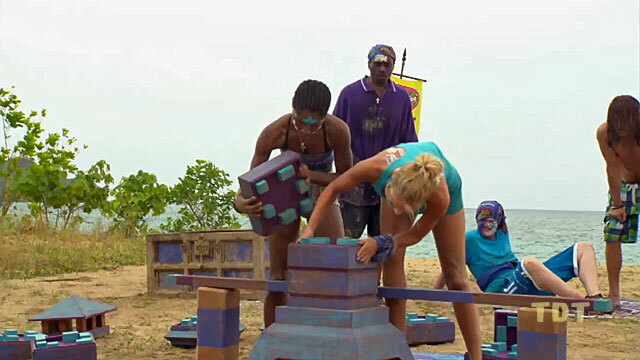 3: Three votes, from Malcolm, Denise, and Russell (voted out, 3-1). Gordon Holmes at XfinityTV.com (9/13/12): "Pre-Game Interview: Angie Layton"
Rob Cesternino at RobHasAPodcast (10/4/12): "How the Cookie Crumbled: Survivor Angie Tells All"
Daniel Fienberg at HitFix.com (10/6/12): "Angie Layton talks Survivor: Philippines"
Steve Helling at People.com (10/7/12): "Angie Layton: I'm Not a Dumb Blonde"
"Personal Claim to Fame: I’m Miss Utah Teen USA 2010 and 3rd runner-up Miss Teen USA 2010. Hobbies: All sports, working out, scrapbooking and hanging with my peeps. Pet Peeves: Lazy people and slow drivers. If You Could Have 3 Things on The Island What Would They Be and Why? The only thing I would bring is my camera so I could take pictures and scrapbook my journey. Survivor Contestant You Are Most Like: Fabio - because people underestimated him for a “dumb blonde” and he used that to his advantage. At the end, he surprised everyone. I am the same way! Reason for Being on Survivor: I want to win, meet some hotties and prove to everyone that I can do it. Why You Think You’ll “Survive” Survivor: Because I am mentally strong, and I have what it takes to survive the elements and challenges. I’m also loyal and easy to get along with. Why You Think You Will Be the Sole Survivor: I know I can manipulate my way to the top! But, most importantly I am extremely competitive and am driven to succeed. I’m not afraid of anything. " "Miss Utah Teen USA 2010 was recruited for the show via Facebook and claims, 'I will win Survivor because I'm awesome.' And who's her favorite Survivor? 'Boston Rob. Just because he's awesome.' Yay, everyone's awesome!!! Angie's age and lack of experience could work against her, however. And you have to worry a bit when someone says, 'I'm not looking forward to the bugs.'"